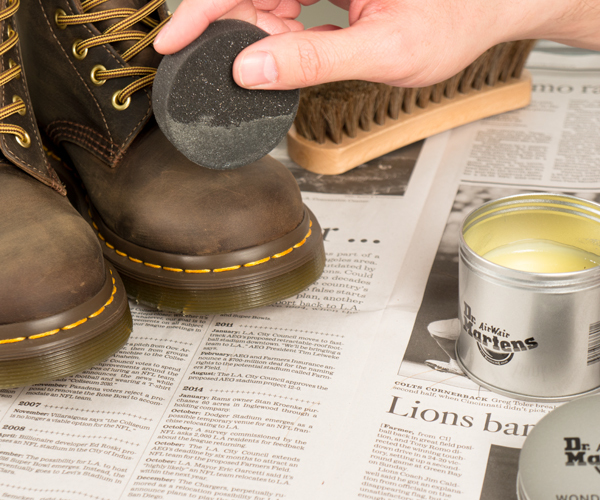 To increase the longevity of your Dr. Martens a little TLC can help. Here is how to keep the leather on your Dr. Martens looking great year round in five easy steps. Step 1: Use the brush to clean off any dust. Step 2: Apply a small amount of Dr. Martens Wonder Balsam with the sponge provided. Step 3: Work in the balsam cleaner into the leather and seams. Step 4: Allow the leather to absorb the Wonder Balsam for five minutes.